Fully equipt efficiancy apt. perfect for your transition here or vacation stay. Welcome to Crucian Seclusion. Located in Orange grove, Christiansted, this first floor fully furnished efficiency apartment gives you the opportunity to share our hillside plateau. You'll have a wooded ridge line above and a large forest below. The grocery is only a 60 second drive away. Our property is located mid island to provide you the convenience of a short drive to all beaches. Christiansted Boardwalk is only a 5 minute drive away! The tap water is rainwater, filtered and 100% drinkable. Utilities are included. There is a full size refrigerator and gas stove. The kitchen is stocked with a coffee maker, blender, microwave, toaster, pots and pans, silverware and cooking utensils. All linens and beach towels are included. A complimentary washer/dryer is easily accessible onsite. There is also a clothesline for your beach towels and things. Air conditioning (should you really need it) is available. Provided is complimentary Wi-Fi, a smart TV, Netflix and a digital antenna to watch ABC and a few other channels. Aside from this unit, there is only one other rental on the property. We live onsite to accommodate your island needs. window unit available if you feel you need it. Some games and a deck of cards. common area with picnic tables and a charcoal grill. We, more than likely have charcoal and lighter fluid for you to use. Owner is very friendly. Room has all you need including laundry. Quiet location for a very reasonable price. Will gladly stay again. The location of this property couldn't have been better. Only a minute from the grocery store and the Christiansted By Pass. Had everything you need for a relaxing vacation. Not on the water but easy to get to in just 5 minutes. The owner Kyle, was very helpful with directions and things to do. I was there for 2 weeks and would feel comfortable going back. Kyle & Lisa are the owners and they are absolutely great!!! We flew into St. Croix last minute and we are so thankful they were able to accommodate our reservation. The place was very clean and close proximity to Christiansted downtown and beaches. There’s a grocery store right up the road from the property. The property included everything we needed for our stay. The rates are very reasonable and would definitely stay there again. P.S. Kyle & Lisa live on the premises so if you need anything they are right there. 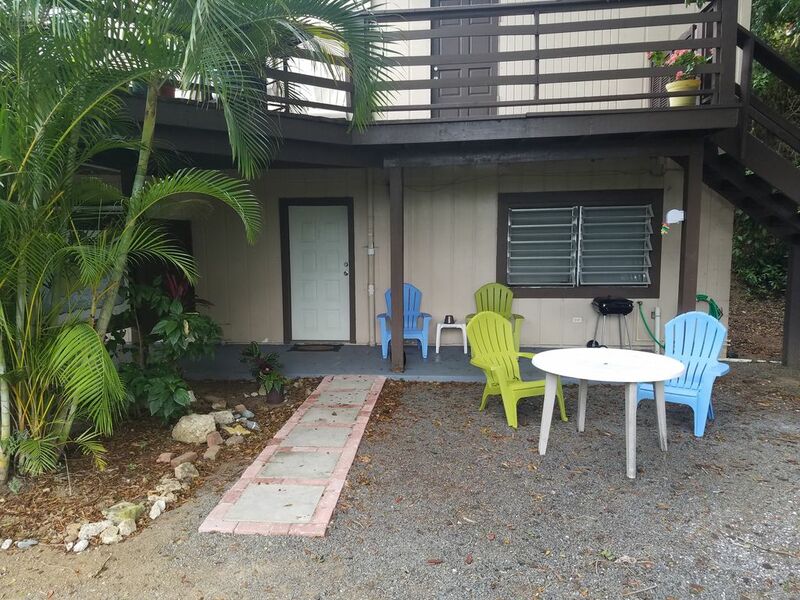 Comfy , convenient, close to Christiansted. If I am coordinating a visit I would start with an island tour ( which I can provide if requested). Tour the Cruzan Rum distillery. Experience the beer drinking pigs at Norma's. Take a pedal kayak tour at sunset at Salt River, one of seven bioluminescent bays in the world. Take in a sunrise at Point Udall, the eastern most point in the United States. Check out the shops and art galleries in Christiansted town. Spend an evening on Christiansted boardwalk for dinner and rum. Then there's the beach! So many of them, and they are all public. Hike to the Carambola Tide Pools and of course, snorkel Buck Island. This is the only underwater national park in the U.S.